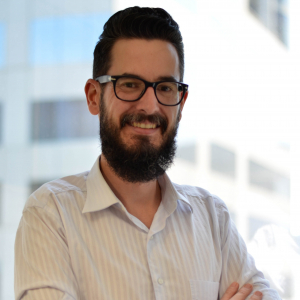 Reflecting on the recent National Climate Change Adaptation Research Facility 2018 Climate Adaptation Conference held in Melbourne there were several themes that stand out for me. One of the main shifts noted in climate change topics was the move away from discussing the data and models that underlies climate science. Unsurprisingly for a conference full of climate professionals and scientists, there is no question of the reality of climate change and the science, data and models that underpin the research. However, the shift from previous conferences attended was there was less discussion around the uncertainty in climate models. Uncertainty is always a factor in any scientific endeavour. No model can be a perfect reflection of reality, as long as the uncertainty is acknowledged and measures are taken to reduce it. The major themes that emerged from the conference revolved around what are considered pillars in the response to climate change; mitigation, transformation, resilience and adaptation. These concepts can be considered as a next logical step from data and model creation, that involves the application of data to inform options for mitigation, adaptation and transformation measures. 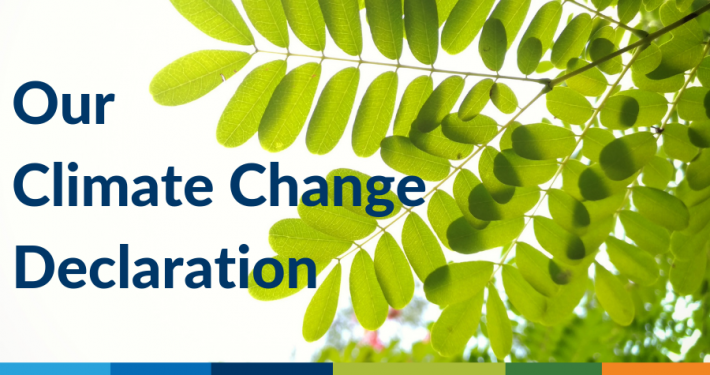 Mitigation considers alleviating climate change impacts in a system. Adaption relates to changing a system in place to reduce vulnerability to climate change whilst maintaining the identity of the system. Whereas transformation alters entire systems from one form to another to cope with climate change impacts. Resilience is a concept that arises out of mitigative capacity but is not full adaptation, it relates more to the idea of a system to absorb changes from the surrounding environment. The main topic in discussion throughout the conference was adaptation. This was seen in presentations on adaptation in infrastructure and urban planning, coastal adaptation, adaptation in agricultural systems or adaptation in health. The idea of adaptation in climate science, and in these presentations, were invariably linked with the planning mechanism known as adaptation pathways. 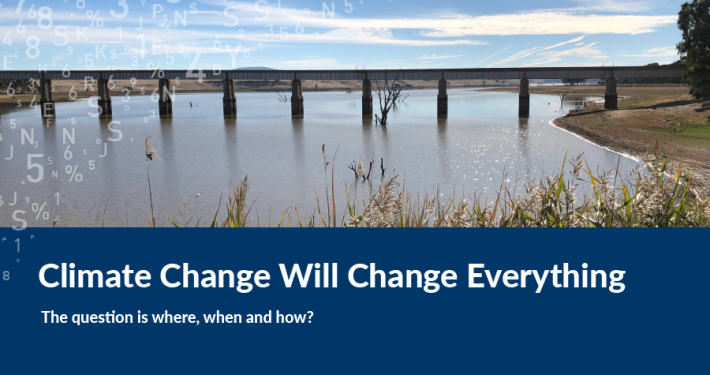 This is a decision making toolset that can be seen as similar to traditional scenario planning, however, rather than using differing climate or change scenarios, each path is an adaptation measure or course of management action. In between each pathway, there are demarcated transfer junctions where there is a either a necessary change, a prescribed change or a safe change between each pathway. These junctions are related to major changes within that particular adaptation path. For example in a coastal setting, as in Figure 2, these junctions can relate to certain sea level changes or extreme events. Figure 2: Adaptation Pathways for Coastal Beach Management Source: Sekac & Birkett (2018). Adaptation Pathways of McEwens Beach – the Journey of a Constructed, Self-funded Seawall. Adaptation pathways can be extremely useful in defining a course of actions. Similarly adaptation pathways can be as useful as a planning and management tool to set priorities and explore ‘what if’ scenarios. If the Coastal Impacts work presented by Spatial Vision is expanded through this adaptation pathways lens, we can assess individual assets and prioritise actions. For example, if residential beach front property is evaluated, adaptation pathways could include installation of revetments or seawalls, property improvements and changes or improvements of onshore vegetation. Junctions between each path could encompass rising sea levels or increasing storm tides or extreme events. Coastal adaptation along with risk and hazard management was a recurring theme throughout the conference. 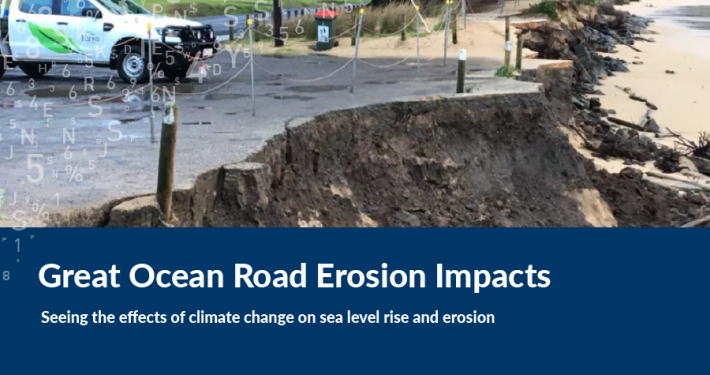 A large contingent of presentations either directly related to this topic, or related to coastal management, or focused on coastal climate change impacts. Spatial Vision presented their work Assessment of Climate Change Hazard Impacts on Victorian Coastal Assets in the Living Better with Extremes: Predictions and Preparedness session alongside other presentations focusing on dealing with climate extremes and building resilience and formulating adaptation actions. 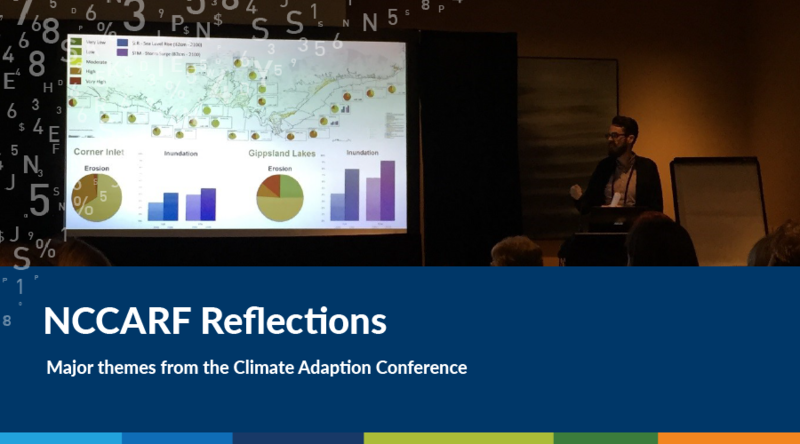 The work presented by Spatial Vision was well received and pertinent, both in the theme of the session as well as the overriding concept in the conference of adaptation and application of climate science in decision support, planning and management. Mitigation, as a topic, was not forefront in the conference. As echoed in a few sessions and presentations, it was generally considered that in many systems and instances we are past the point of mitigation and that we need to consider adapting or transforming to cope with climate changes. However, as an overall concept, the assessment of mitigation has progressed into the application of adaptive capacity measures, either inbuilt or introduced into a system, as well as the evaluation of resilience in a system to withstand influences and impacts of climate change. Resilience in the conference was seen in several presentations through the lens of disaster management and resilience. This is mainly in response to climate extremes and influences on a system. In one of the morning plenary sessions, Disasters and Resilience, Craig Lapsley from Emergency Management Victoria presented the impact of climate on a Victorian perspective in emergency services and how these organisations are planning responses to extreme weather events and adapting to climate change. One key message was that there is a need to move past a risk and hazard approach to resilience and adaptation planning. Focus should also be inclusive of a community perspective to include emphasis on community resilience and community connections at the small scale local level. Figure 4 & 5: Day Three: Morning Plenary Session – Disasters and Resilience. Craig Lapsley, Victoria’s Emergency Management Commissioner – Climate Change and Emergencies; The Victorian Experience. Transformation was not a major topic covered throughout the conference. Taking this course is seen as a ‘point of no return’ and is usually only considered when all options are exhausted, or when adaptation options are fully played out. Transformation ideas such as geoengineering, full human intervention in a system, or genetic alteration of a biological system were explored in a few sessions, primarily in the opening day plenary session relating to Pushing the boundary- beyond traditional approaches. Topics that investigated transformation included thinking about refreezing the Artic and non-traditional approaches to management of the Great Barrier Reef. Figure 6: Day One: Morning Plenary Session – Pushing the Boundaries; Beyond Traditional Approaches. Transformation and Geoengineering Proposals. Presentation by Hugh Hunt, Cambridge University – Geoengineering: Can we Refreeze the Arctic? Overall the conference was a move past the traditional data and science focused climate conferences attended previously. There was a greater emphasis on practical applications and outcomes of climate science as well as adaptation measures in planning and management.